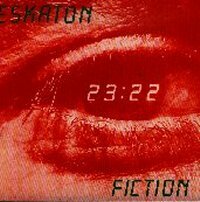 « Human, too human » The lowest attack on Eskaton was to call it messianic. Today,looking back, we’d say « International reporter » Nothing has moved. Everything is different. A belief remains, a blinding and incredible belief That we will have to mutate or die That Man is this rope strung between the worst and the best. Ahhh…the last album from this excellent pop Zeuhl band from 1982. In 2003 we featured the archive reissue Ardeur release…and this contains the same lineup. For those that don’t know, these guys were pretty much up there with the stature of Magma. Hailing from Paris , these guys had a strong influence from Magma in the earlier recordings, but molded out with their own sound into the early 80′s. Emerging in the very late 1970′s, this band was one of the first of the genre. Fiction was their second vinyl album that was recorded in late 1982, and is superbly reissued for the first time. All remastered from the original master recordings. This reissue features four bonus tracks from their never released final album Icare. You may have heard one of the tracks before, but this includes 3 tracks never released. Alain at Soleilzeuhl has done it again. A must have archive recording for 2005! After the awesome sounds of the debut vinyl album, ‘Ardeur’, their second album appeared on the scene with the rawness replaced by an altogether smoother sound, something that made the Magma fans at the time, see this as a lesser album. Well, now it’s been released on CD as a remastered production, the track list has been changed to give a much more dynamic flow to the music and, with the addition of five tracks and twenty-six minutes of previously unreleased tracks, now comes across as every bit as essential listening to any Magma fan. The opening six and a half minute instrumental, ‘FX’ immediately showcases the instrumental prowesses of the band as a compositional and playing force with which to be reckoned, the pounding electric bass thundering under the lead keys and synths work while crunchy drums power it all forward and the guitar chording completes the picture. Following this, it’s onto the four minutes of ‘Les Deux Trucs’ and here we’re solidly into classic mid-late seventies Magma territory with the trademark growling electric bass, electric piano chords that ring out, drums that are so solid, while a combination of dual female and lead male vocals provide the icing on the cake, as the lead guitar scythes its way through as main instrumental soloist over what is a full, powerful and dynamic sound. Just short of five minutes long, ‘Automute’, previously sounding a touch weak, now comes alive with a vengeance, as the remaster reveals a sound that is crystal clear and SO powerful, as the high-flying female vocals from Paule Kleynnaert & Amara Tahir propel the song above a backing that is simply sensational as the rhythm section fires up and the synths and keys and guitar provide a triple threat attack that will have the hairs standing on the back of your neck – heaven with a difference for Magma fans. From there on in, the main album reveals track after track that, while heavily Magma influenced, has elements of an almost ‘Canterbury’ nature to the music with plenty of soaring lead work from electric piano, synths and electric guitar, all the while with the rhythm section flying underneath and providing the rock solid foundations the music exudes. What I had forgotten about this album was just how much instrumental space there was devoted to the band, with the vocalists working a treat in flying Magma fashion but used, to a degree, more sparingly for maximum effect. Of the five previously unreleased tracks, the four minute ‘Le Musicien’ from a year later than the main album, features some fantastic electric bass and guitar work over crisp sounding rhythms and magical harmony vocals, that trademark mid-paced Magma-esque rhythm pushing it forward. The final four tracks, taken from an album recorded in ’85 but never issued, are all excellent and give the female vocalists a lot more presence, which comes as a most welcome addition to the earlier more instrumental main album. With keys, synths and guitars leading the way, a tremendous production throughout and heavenly vocals, this is a must for fans of Magma and similarly styled bands.